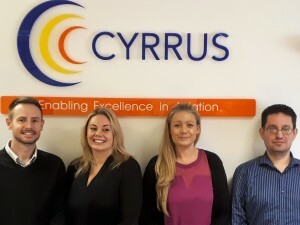 Cyrrus is delighted to welcome Mitchell Nunes, Sally Porter, Helen Riley and Ewan Frater to the Cyrrus team. Mitchell has been appointed to the role of Instrument Flight Procedure Designer. Mitchell is a seasoned practitioner and has over 10 Years’ Procedure Design experience supplemented by a wider aviation knowledge having worked previously in AIS and on the airport ramp. Sally had worked for Cyrrus for 5 years prior to taking a brief sabbatical outside the industry last autumn. We are pleased to announce her return to the Company in the role of Service Delivery Officer. Helen who has accumulated over 10 years’ experience in accounting and finance is qualified to AAT level and takes up the post of Financial Officer. Ewan will assist in the on-going success of the Safeguarding division. Ewan has a wealth of experience with AutoCAD, GIS, BIM and 3D modelling having spent a decade in the construction industry working on numerous domestic and international projects.